At the January 2001 WPA meeting Ellen and Jim Tyne gave an excellent presentation on Purinton Pottery. In addition, Jim prepared this article for your reading enjoyment. From 1939-1959 Purinton Pottery manufactured a wide variety of hand-painted dinnerware. Their output was certainly comparable in quality and beauty to that of contemporaries like Stangl, Blue Ridge, Redwing or Pennsbury. Ellen and I first became interested in Purinton at the 1993 Watt Pottery convention. Lori Hinterleiter-Kimball and Jim Schulte gave a presentation on the connections between Esmond, Watt and Purinton, displaying pieces from their collections. Intrigued by a whole new world of shapes and patterns, we soon purchased our first piece, a Red Ivy honey jug, for $6.50. We subscribed to their just launched Purinton Pastimes newsletter. I proceeded to spend a lot of time on the phone with Jim, talking pots and all types of things. We met again at the 1994 Zanesville Pottery Fest and a few days later at the first annual Purinton Get-together. Ellen and I were hooked, and soon had nearly a hundred pieces. We even started using Purinton as our daily dishes. In 1936 Bernard Purinton purchased the East Liverpool Pottery Co. and incorporated the Purinton Pottery Co. in Wellesville, OH. He had studied ceramics at Ohio State U. and become general manager of the East Liverpool Pottery from 1931-36. He was working on a new cost effective and efficient casting method, which was patented and called slipware. One innovation was the casting of pieces in quantity, molds being placed on racks so that multiple pieces could be cast at one time. Pieces were cast with handles intact rather than added later. Decorating was done on greenware rather than on bisque, thus one less firing was needed. The Wellesville plant remained open until 1941 producing mainly casualware. They made jugs and tumblers, snack trays and mugs, candlesticks and other accessories for use at picnics, coffees and other informal situations. Much of this early ware was in solid colors, but even more successful were pieces decorated in simple bold Peasant Ware patterns. Artist and ceramicist William Blair, brother of Bernard’s wife Dorothy, and five other decorators painted these Wellesville decorations, which at that time had no formal names. Sales were good with distribution in larger department stores across the country. As the war escalated, china and pottery imports dropped dramatically and Bernard P. saw the opportunity for growth. 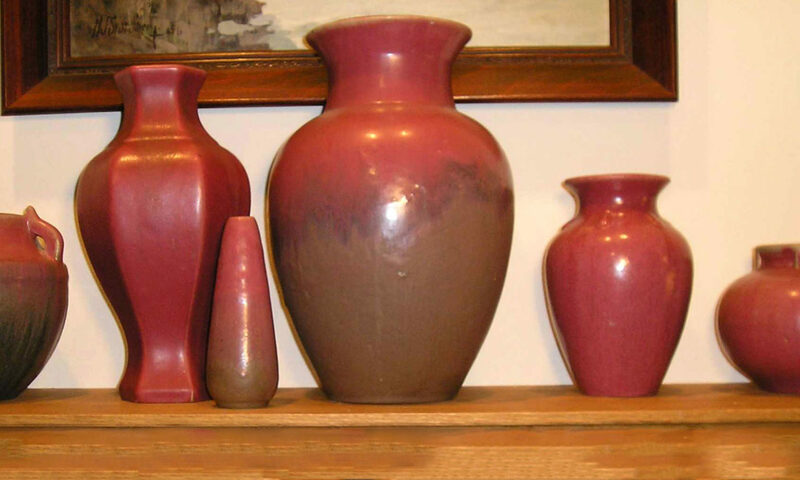 With the encouragement and financial help of the Clarion County, PA Chamber of Commerce, the pottery moved to a newly constructed and larger plant in Shippenville, PA in 1941. A handful of new employees were sent to Wellesville to learn decorating and casting, but only one employee was transferred to the new facility. McCormick Tea Co. contracted with Purinton to produce 50,000 individual teapots. The first 100 made were inscribed “BP 12-2-41” on the bottom and are quite collectible today. These solid yellow teapots were the first items to come out of the new kiln on Pearl Harbor Day 1941. With the U.S. now fully engaged, metals and glass were diverted to the war effort. Pottery was in demand, so Purinton began its move into dinnerware. Many shapes were retained from the early days, but only the Fruit and Crescent Flower patterns were continued. William Blair was instrumental in this transition. He designed the Apple pattern, called d-46 at the plant, which was then and is now the most favored pattern. It was produced in quantity for as long as they were in business. He also developed the Intaglio pattern, popular then but ignored by collectors now. Blair created the off-round shapes of the dinnerware lines, one small win for his modernist sensibilities. He left the company, returned, then left for good in 1943 to begin his own Blair Ceramics in Ozark, Missouri (1946-mid 1950’s). Purinton made pottery for the National Pottery Co. (Napco) of Cleveland, mostly floral pots and planters, much of it in solid colors. Napco supplied their own molds and decorations, some of which were appropriated by Purinton for their lines, such as Ming Tree. From 1948-1953 Purinton ran a second plant in nearby Tionesta. This site made mostly planters and items for other companies like Rubel, a New York company which specialized in giftware. Work was done for Taylor Smith and Taylor, who also brought in their own molds and patterns like Tulip and Vine and Southwestern. The most famous TS&T items are the very blue-eyed Howdy Doody cookie jar and bank. Both are quite expensive cross-collectibles, though not too hard to find. Ellen feels the Howdy head cookie jar is the ugliest piece made by Purinton. For a few years we had a lidless cookie jar sitting on top of our fridge, but Howdy has moved on to another home. Many items were made for Esmond, including those four part revolving canister sets that clutter up antique stores everywhere. After Purinton closed, Watt made them until 1965, then McCoy, then Japanese companies. In the mid 50’s, Napco started buying their floral ware from Japan. As that market faded, Purinton’s new focus was on starter sets and accessories and they aggressively continued to develop and market new designs. The gap caused by William Blair’s departure was filled by his sister Dorothy Purinton. Though never actually employed by the company, she had taken over the training of decorators and became the main designer of new patterns. Some 20 plus patterns were marketed and advertised in magazines like the New Yorker. Most successful in the 50’s were Brown Intaglio and Apple, Normandy Plaid, and Pennsylvania Dutch. Others were Mountain Rose, Chartreuse, Saraband, and an experiment on green-colored slip called Maywood. A new piecrust shape was introduced on a single pattern called Seaform. Purinton continued production of floral ware. According to my pal Jim S., their company motto could have been “everything is a planter.” Every possible shape, honey jugs, grease jars, inverted canisters, and almost every piece of hollow ware in their line was marketed as a planter at some point and was sold by the caseload. The Palm Tree pattern was made for a store in Fort Myers, FL. run by their son John Purinton. A line of jewelry called Kay Kraft was developed for this same outlet. Palm Tree is a favorite of collectors and brings high prices. The jewelry is rarely found. As the 50’s drew to a close, Purinton encountered the same situation as many other American potteries. Cheap imports of floral ware and dinnerware and knickknacks were driving them out of business. They could not match the prices, and would not give up on the time-consuming and costly process of hand decorating every piece. In 1958 TS&T bought the majority of stock shares and ran the company as a subsidiary for a year. Then in the fall of 1959 the doors closed for good. Their remaining stock was sold in their local outlet, the Country Cupboard, until 1962. Early Peasantware patterns like Desert, Cactus and Crescent Flower have become quite treasured. Wellesville pieces are quite hard to find. One such piece is the Oasis jug; a bowling ball shaped beverage pitcher. Most of them collapsed in the firing, which makes them extremely scarce. Dinnerware patterns like Pennsylvania Dutch, Mountain Rose, and Peasant Garden draw premium prices. Others like Petals and Palm Tree, and the ubiquitous Fruit (apple and pear) appear mainly on accessories. Shapes are another popular way to collect. Some people love the kent jugs, others concentrate on the individual cream and sugar sets. Souvenir items from places like Cooks Forest or the Pennsylvania Grand Canyon (?) have become quite popular. Also desirable are children’s dishes, Christmas items, and of course lunch hour and one of a kind pieces. But most of all people want signed items, especially chop plates, by Dorothy Purinton, William Blair and others. At the top of every Purinton collector’s wish list is a “Dorothy” plate. These were hand-painted, one-of-a-kind plates made for holidays and special events, and were often given as wedding or anniversary gifts. She used variations on regular patterns such as Apple or Penn. Dutch, or sometimes improvised with log cabins and other rustic scenes. Many contained Dutch phrases (like Pennsbury) or simple kitchen blessings. A favorite was the Robert Burns poem “The Selkirk Grace”. These pieces command huge prices. If you want to read about Purinton there are several options. Pat Dole, editor of “The New Glaze” wrote Purinton Pottery in 1984, with a follow up entitled Purinton II in 1990. These slim booklets were nicely done and a great help to the first wave of collectors. Both are long out of print. In 1994 Sue Morris wrote Purinton Pottery, following closely the success of her Watt Pottery of 1993. At that time many people were speculating on Purinton, thinking it would be the next big thing. Then came Purinton Pottery by the Johnsons in 1997, which pictured many items not previously shown. Price guides were included in both, and both are currently out-of-print, though easily located. “Purinton Pastimes” had a run of 28 issues from 1993 until 2000, when the editor decided to pass it on to another long time collector. Renamed “Purinton News and Views” it continues to this day with no loss of quality. From 1936-1959 Purinton produced millions of pieces of hand-decorated dinnerware and pottery. Every piece individually hand painted, stencils and decals were never used. They had both a country look with their Apple and Fruit and Dutch motifs, and a 50’s modern approach with their Saraband, Chartreuse and the Intaglios. Purinton is affordable, durable and useable; their dinnerware lines are still a good value, as are the floral pieces. With a little study and some legwork, even the good pieces turn up. Purinton may not be as well known or as widely collected as Blue Ridge or Stangl, but in the long term, it should hold its own against most American dinnerware. Bero-Johnson, Jamie and Johnson, Jamie. Purinton Pottery. Atglen, PA: Schiffer, 1997. 224 p.
Cunningham, Jo. Best of Collectible Dinnerware. Atglen, PA: Schiffer, 1995. 192 p.
Dole, Pat. Purinton Pottery. Birmingham, AL: Pat Dole, 1984. 44 p.
Dole, Pat. Purinton Pottery Book II. Denton, NC: Denton Pub., 1990. 40p. Lehner, Lois. U.S. Marks on Pottery, Porcelain & Clay. Paducah, Ky: Collector Books, 1988, 634p. Morris, Susan. Purinton Pottery. Paducah, KY: Collector Books, 1994. 272 p.
Hinterleiter, Lori. “Purinton Pastimes” v.1 no.1 April 1993v.7 no.4, January 2000. McManus, Joseph. “Purinton News and Views” v.1 no.1 April 2000-present.